After Obama was elected President of the United States, during his first years in office, there were liberal British academics who praised Obama’s writing as similar to the ancient Roman consul, Cicero, who had distain for the Roman plebian class but was the darling of the middle class of Rome. Obama’s writings were praised in America and the Western world as being gems of literary brilliance, and the list could go on about his generous and kind personality, in which all this pandering to the man, we could say influenced those who awarded him the Nobel Peace Prize. Ironically, Obama would become the longest war president in American history, although he accepted the Noble Peace Prize without blushing. Barack Hussein Obama II will be remembered as one of those world leaders, who like previous demigods, political narcissists, and militarists in history, was able to hide behind the veil of duplicity, in this case the veil of neo-liberal democracy, as he moved forward towards his oligarchic aspirations. However, those who praise such men in their time, forget the more detailed aspects of comparing supposedly great men to so-called contemporary great men. Let us make some observations of Barack Obama that may be seen as contentious and controversial in our time. Let me write about what others are only thinking privately to themselves about the American President, Barack Obama. What most American pundits, media journalists, and other well-meaning people who promote such men as Obama as a great statesman may not be aware of, is that a dubious recognition of any public man to be enshrined in history as a great man can be a tragic mistake, while the comparison of the second ‘great man’ to be similar to first historical figure can be farcical. Cicero lost his life because he refused to understand Rome’s civil war as a class struggle, he played dangerous, political games with his various adversaries, and he would eventually be beheaded, while it was noted in history that Antony's wife Fulvia took Cicero's head, pulled out his tongue, and jabbed it repeatedly with her hairpin in a final act of revenge against Cicero's power of speech. It is true that Obama has the power of speech to enthrall the American bourgeoisie and national minorities of the middle class, who view him as a man who would keep them afloat in a declining American society. What they do not realize is that Obama’s silver tongue is vulnerable to his narcissism. However, although there are those who want to give an illustrious cameo to Obama’s regime or administration, I would give this observation, and that is that Obama is more aligned with the fascist movements prior to World War II that believed in the corporate military industrial complex as the future for the Western World. Obama has a neo-liberal political ideology that is allied to the wealthy financial, American classes and military industrial complex, which also sees the potential for a world order that Mussolini could only dream of from a balcony in Rome. With this all being said about what I consider to be Obama’s general political pursuits, there is an Achilles’ heel in the man’s personality that reveals him to be closer to the Weimar Foreign Minister, Walther Rathenau, a German Jew and therefore a German minority, who mixed romantic literary philosophy with moderate liberal politics and who showed a distained for the early Soviet Government after World War I. Rathenau was eventually assassinated by a German right ultra-nationalist terrorist group, and Rathenau would vanish quite quickly into history as fascism in Germany gained ground over the German masses. Obama, like Rathenau who attempted to build-up the German industry after Germany’s defeat during World War I, attempted to revise an America in decline and bailed out the American capitalist system in its crises by forgiving the corruption of the bankers’ scandal, which deprived of thousands of Americans of their life savings, and he also pursued trade agreements that would globalize American unilateral free trade agreements, which in turn threatens other emerging nation-states. If Rathenau was a dogmatic, German nationalist, Obama is a mercurial, American nationalist, who although hated by the American right-wing nationalists, believes that through reactionary duplicity in foreign policy and waging endless war, he could achieve his political objectives and appease his right-wing enemies. In essence then, Obama is a mixture of past and contemporary, zealous world leaders who wanted power on their terms and only on their terms, not understanding how quickly the world would turn against them. Obama is a narcissist and individualist who has carefully cultivated a warm, nurturing personality with an academic aloofness that he wanted the American people to accept, while at the same time moving the country towards a nation-state oligarchy. He has also methodically goaded the American people into a war with China and creating a hatred for Russia, while preparing for an ultimate invasion of that country with the assistance of NATO. Barack Obama, who in his early political days allowed himself to be groomed by the liberal, left wing of the Democratic Party, for a higher position than that of a United States Senator, would eventually transform himself into a political chameleon. Obama wanted the American presidency because it would allow him to hone his own vision of an American nationalist, corporate nation-state that would be wrapped in the political garb of neo-liberal democracy. Obama’s youthful years with his romanticism for Marxism died, when he entered the American world of material influence, with all its personal and political corruption, along with an innate urge for absolute power as envisioned in Washington. One might ask, why would the author of this essay use the term “nationalist corporate nation-state” which has the odious smell to a reactionary ideal called nationalist socialism, when describing Obama’s political agendas? Why describe the workings of the Obama administration or regime in such a way? In the political sense, we could say that modern nationalist socialism is a military-industrial program that moves outward from the boundaries of a nation-state and seeks economic and territorial expansionism due to the leaderships’ attitude of seeing itself and its people as both privileged and exceptional. In the early years of the twenty-first century, the Obama regime has transformed into an oligarch regime in the sense that multi-corporate, American leadership and the United States military complex have surrounded themselves around the presidency of Barack Obama to further their craving for more wealth and hegemonic power. In this personal observation, I would say further that Obama is a Janus figure masquerading as a neo-liberal politician while at the same time manipulating the American people into his web of a corporate-military nation-state. Obama’s two-faced political posturing can be linked, as I have said previously, to the past of benign fascist dictatorships, but can also be understood in terms of a failed advancement towards the dream of American hegemony. "Four and a half years later, as you graduate, the landscape has changed. We have removed our troops from Iraq. We are winding down our war in Afghanistan. Al Qaeda’s leadership on the border region between Pakistan and Afghanistan has been decimated, and Osama bin Laden is no more. (Applause.) And through it all, we’ve refocused our investments in what has always been a key source of American strength: a growing economy that can provide opportunity for everybody who’s willing to work hard and take responsibility here at home. In fact, by most measures, America has rarely been stronger relative to the rest of the world. Those who argue otherwise -- who suggest that America is in decline, or has seen its global leadership slip away -- are either misreading history or engaged in partisan politics. Think about it. Our military has no peer." In July of 2016, Obama admitted to the world after his trip to Poland that he would leave 3,000 more troops in Afghanistan than originally planned in his war against the Taliban and other Afghanistan nationalist groups. The CNN reporters wrote that “The decision means that Obama, who came to power vowing to concentrate on winning the war in Afghanistan, after what he saw as a diversion by the Bush administration into Iraq, will hand responsibility for America's longest war to his successor. And by adjusting his target for troop numbers, Obama was implicitly admitting -- despite insisting that U.S. forces had forged great progress in Afghanistan -- that the situation at the end of his administration was not as positive as he might have hoped”. 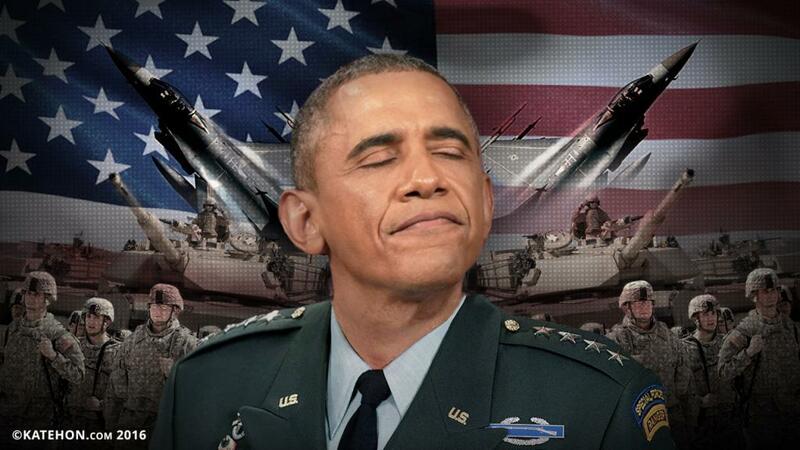 Thus, it is admitted by Obama that he has failed to end the longest war in American history. "The incremental U.S. troop growth is more of a White House strategy to wage war on the cheap—especially in a conflict that Obama hailed when all U.S. troops finally came home at the end of 2011. Sen. John McCain, the Arizona Republican who chairs the armed services committee, called the latest deployment “the kind of grudging incrementalism that rarely wins wars, but could certainly lose one.” It has led to a fingers-crossed kind of fight, with the U.S. seeming to dispatch only sufficient force to handle an immediate need, until it’s no longer adequate—and then sending more. This tendency has generated ire among some U.S. military commanders, but the top brass has gone along with Obama’s desire to keep the U.S. military footprint in Iraq as small as possible." Even if Obama gives mixed signals about his war strategy, or whether he is a man pursuing peace through war, what is obvious is that he is known as the” War President”. Much could be written, and will be written as history in the future, on how Obama helped to create an infused hatred towards America by supporting and arming his so-called moderate, rebel forces in Syria that attempted to end the rule of democratically elected Bashar al-Assad. What has long been apparent is that Obama and his American neo-liberal cohorts are anxious to control the Middle East at all costs, even if it triggers a regional war or a world war. Obama has created the imperialist mantel for Hillary Clinton to continue her quest to destroy the nation-state of Syria, in her zeal to appease Israel. In an unclassified memo that Clinton wrote, we see her international, political designs, while she attempts to reach out to gullible and naïve American voters, evoking the idea that she is a presidential contender that avows to pursue a peaceful agenda in a nefarious and volatile world. "The best way to help Israel deal with Iran's growing nuclear capability is to help the people of Syria overthrow the regime of Bashar Assad… Bringing down Assad would not only be a massive boon to Israel's security, it would also ease Israel's understandable fear of losing its nuclear monopoly." Obama, the Nobel Prize Winner, but who is actually a militarist in the imperialist sense, has endorsed a presidential candidate who envisions herself as a leader to wage war not only against Syria, but even against Iran or Russia, if such possibilities should occur. Obama would have the American people believe that the American economy is becoming more productive, when in fact even if Americans are becoming more involved in the labor market, one has to ask how many jobs an American worker must hold to keep themselves alive, and what kind of working conditions must they endure in the fragile welfare of their health? It is these same Americans who give their sons and daughters, husbands and wives, to the American Armed Forces, and who without modern equipment to give them support on the battlefield, would be nothing but a third world military power. The United States does have peers that are capable of defeating them on the battlefield, on the seas and in the air, and that is the rejuvenated Russian Armed Forces and those maturing military forces of the Peoples’ Republic of China, who are posed to wage a People’s War in the South China Sea if necessary. In the smoldering political fires for self-determination in Eastern Ukraine, we should remember that it was the C.I.A., with the approval of Obama, that sanctioned the coup d’état against the legitimate Ukrainian Government, and which in turn has created the possibility for a wider civil war in that country which borders Russia. It is well known what the intentions are for such intervention, as Obama and some of his generals, along with their surrogate allies within NATO aspire to unconditionally surround and destroy Russia. In the title of this essay, I use the word “Narcissist” to describe a characteristic behavior of Obama’s political personality. However, to make such a statement, I must be able to show how such a behavior or personality trait can be hidden from the public at large. Being a narcissist in the political sense does not mean the individual is mentally ill, but what it does mean is that such a personality can harm or even destroy the welfare of a people. Obama is a mirror of the American peoples’ will. Obama mirrors what the American people desire or desired for leadership. Now, in his West Point address, Obama stressed this kind of leadership through the term “Exceptionalism”. "I believe in American exceptionalism with every fiber of my being. But what makes us exceptional is not our ability to flout international norms and the rule of law; it is our willingness to affirm them through our actions. (Applause.) And that’s why I will continue to push to close Gitmo -- because American values and legal traditions do not permit the indefinite detention of people beyond our borders. (Applause.) That’s why we’re putting in place new restrictions on how America collects and uses intelligence -- because we will have fewer partners and be less effective if a perception takes hold that we’re conducting surveillance against ordinary citizens. (Applause.) America does not simply stand for stability or the absence of conflict, no matter what the cost. We stand for the more lasting peace that can only come through opportunity and freedom for people everywhere." Obama did not close Gitmo prison camp; there are thousands of Mexicans immigrants in detention camps in the United States; and he has signed the Executive Order on Pre- and Post-Strike Measures to Address Civilian Casualties in U.S. Operations Involving the Use of Force in which it the first Section reads “Section 1. Purpose. United States policy on civilian casualties resulting from U.S. operations involving the use of force in armed conflict or in the exercise of the Nation's inherent right of self-defense is based on our national interests, our values, and our legal obligations” which in a word, is a contingency plan for dealing with an uprising among the American people. When Obama speaks of American exceptionalism, he is not only extolling extreme and primitive American nationalism, he is also expressing a reactionary persona that is a part of the “every fiber” of his being as he acknowledged. The tragedy is that his heritage is that of an oppressed African American peoples’ history, which he has done very little to change. The Black American working class has become a scapegoat, like the Jews and Slavic immigrants in Nazi Germany became when Nationalist Socialism became the order of the day. In essence through his political behavior and rhetoric which is subtly insidious, Obama expresses his narcissistic and militarist personality. “The White House staff for national security, exempt from review by Congress, plays a substantial role in the process for killing suspected terrorists, according to a newly released document on drone strikes. The 2013 document, known informally as the 'playbook' for Barack Obama’s signature counterterrorism operations, was released on Saturday by the justice department as the result of court requests by the American Civil Liberties Union. The playbook provides the closest look to date at the bureaucratic machinery of global killing that Obama will pass on to Hillary Clinton or Donald Trump”. Such are the dangerous presidential candidates that the American people have to vote for, and which in part was created by Obama’s obsessiveness to dominate the world by his regime’s “playbook” which can only lead to war abroad and oppression in the homeland. In closing in my observation on Barack Hussein Obama II, I recognize that I will not gain popularity from either the Left or Right in America, but then I always remember a commentary regarding anti-intellectualism in this country, and how complex opinions or studious observations do not take resonance with the American people, for as the French historian, Alexis de Tocqueville remarked “I know of no county in which there is so little independence of mind and real freedom of discussion in America”. There have been various copies of men like Obama in history, and he will not be remembered as an original in history.